The international medical humanitarian organisation Médecins Sans Frontières / Doctors Without Borders is supporting hospitals in the northern city of Aleppo with medical supplies following a wave of airstrikes which reportedly killed over 100 people and left many injured. Syrian helicopters started dropping barrel bombs on December 15 on several areas of eastern Aleppo. Despite widespread suffering, these indiscriminate and sustained attacks were still going on today and have caused significant damage in areas populated by civilians. "Doctors face extremely difficult decisions"
The emergency is overcrowding the network of hospitals in Aleppo and leaving them with little or no resources. The frequent episodes of violence are destroying the city, with devastating consequences for the healthcare system. Since the war started, most of the hospitals in Aleppo have been partially damaged or destroyed. This wave of attacks is having a cumulative effect on the already exhausted healthcare facilities. “For the past three days, the helicopters have been targeting different areas, among them a school and the Haydarya roundabout, where people wait for public transport vehicles,” says Aitor Zabalgogeazkoa, MSF coordinator in Syria. “Repeated attacks often lead to chaos and make it more difficult to treat the wounded, therefore increasing the number of fatalities,” says Zabalgogeazkoa. The structural lack of support to hospitals in Aleppo and the difficulties to send medical supplies are affecting the capacity of the medical facilities to treat patients. The massive flow of patients after this wave of attacks has emptied the stocks of critical drugs and medical materials for life-saving activities. 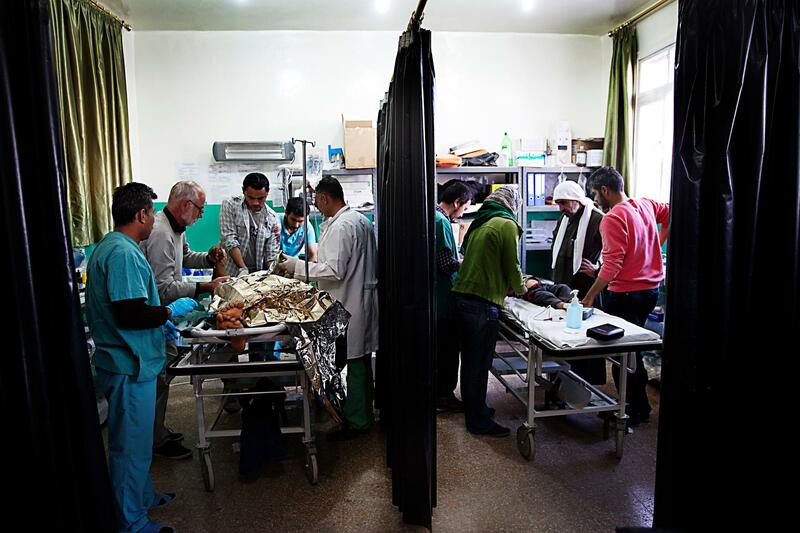 In November, MSF treated 88 wounded in less than a week as a result of the attacks in the northern areas of the city.